World Environment Day is an annual celebration that happens each year on June 5th. It is the United Nation’s principal vehicle for encouraging worldwide awareness and action for the protection of our environment. Held for the very first time in 1974, each year carries a different themed message for environmental awareness and action. This years theme is reconnecting with nature and you are encouraged to get outside and show the World Environment Day network that you’re #WithNature. Allow yourself to breathe in the beauty and remember that by keeping our planet healthy, we keep ourselves healthy too. 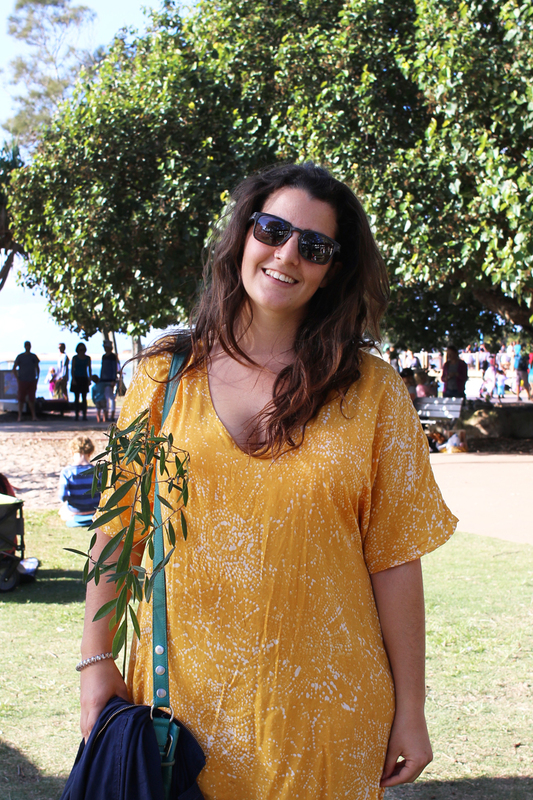 World Environment Day In Cotton Tree Park. 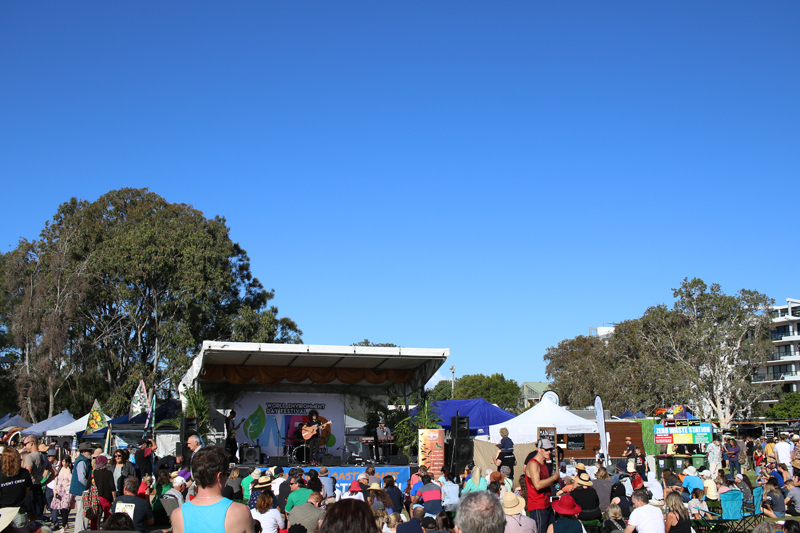 I’m fortunate enough to live within walking or cycling distance to the Sunshine Coast’s wonderful WED festival held in Cotton Tree Park by the waterside. 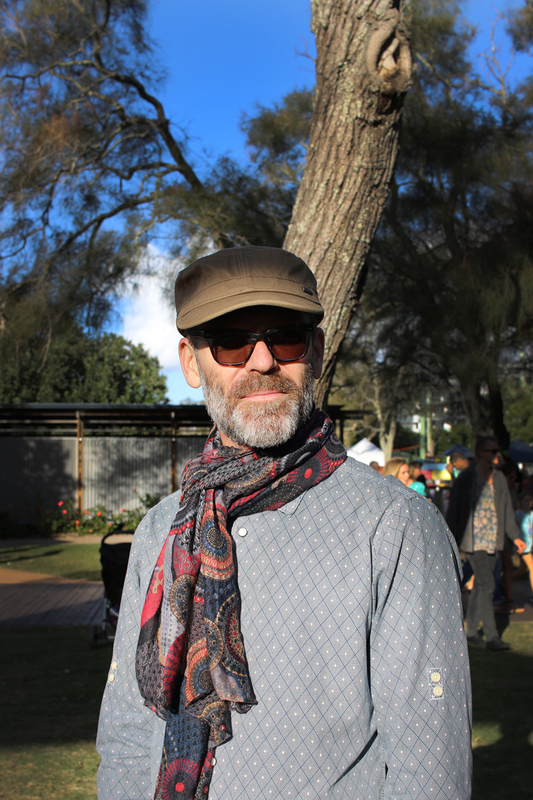 The event yesterday was showered in winter sun and full to the brim with like-minded-eco-folks. I took advantage of the stylish sustainable crowd to get the ball rolling for my #garmentgratitude movement. If you aren’t yet aware I have created my own little sustainable education strategy to get people thinking about their relationships with their clothing and the planet. You can read more about it here. It’s something that’s open for all to participate in (make sure you tag me on social media) and I would love it if you could share your what you are wearing, what you appreciate about it, and what positive eco action you could do while wearing that item. I will share some of the launch stories below but you will find them all over on the Garment Gratitude Movement page and on the @garmentgratitude Instagram account (as I trickle them out over the next week). ‘I will recycle and reuse my beer cup’. Boom! Enough said. Turns out Lucy is in the process of creating her first jewellery collection (Orion’s Belt) which judging by the rings on her fingers (which, in hindsight I should have photographed…DUH) looked pretty gosh-darn awesome. Her eco actions included ‘planting my new native plant and removing some weeds from my garden’. Sorry folks Emma doesn’t have an Instagram account. I’m lucky enough to know this beam of sunshine from my local Source Bulk Foods store in Maroochydore. 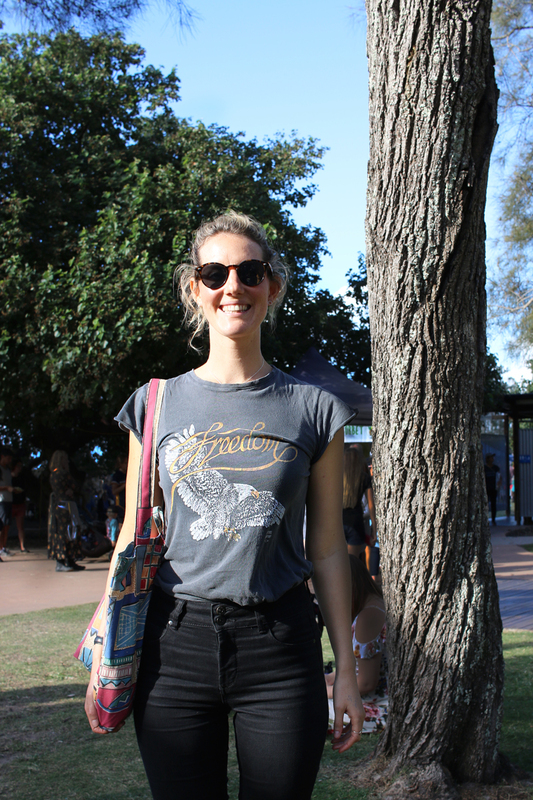 She was enjoying the festival vibes and really wanted to get involved with the #garmentgratitude movement. Jenna wanted to say a big thank you to the people who made her jeans because the keep her ‘warm and comfortable’. Having just been to the Boomerang Bags stall Jenna was the proud owner of a brand ‘new’ upcycled bag. She showed it off to me and proceeded to tell me all about the goings-on of the Boomerang Bag moment. Boomerang bags are an Aussie initiative developed to fight single use plastic bags and get people working as a community to reduce waste. 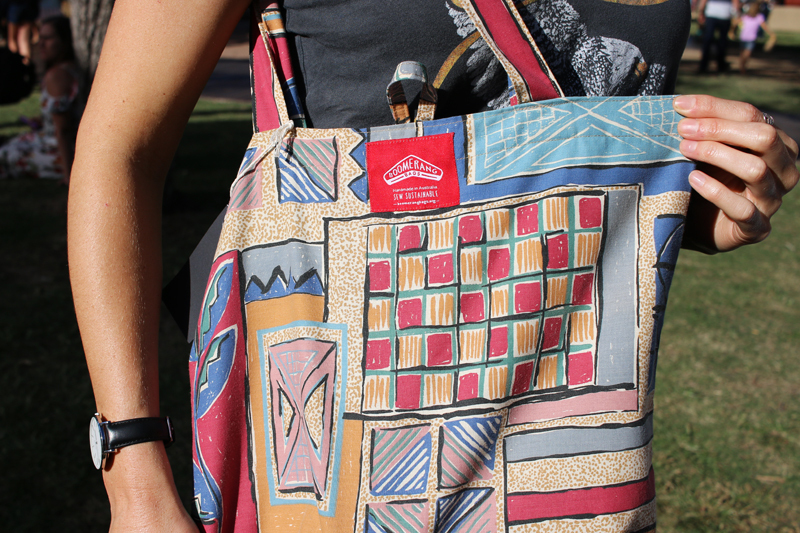 The made upcycled bags that are used in participating communities as a returnable alternative to plastic bags. Jenna kindly offered her friends up to the #garmentgratitude cause. I was strolling through the park at World Environment Day and spotted the most amazing bag, jacket, and bangle combo. When I stopped to ask if the owner of this visual awesomeness would be OK with a photo I found out that we had spoken in the past via email. 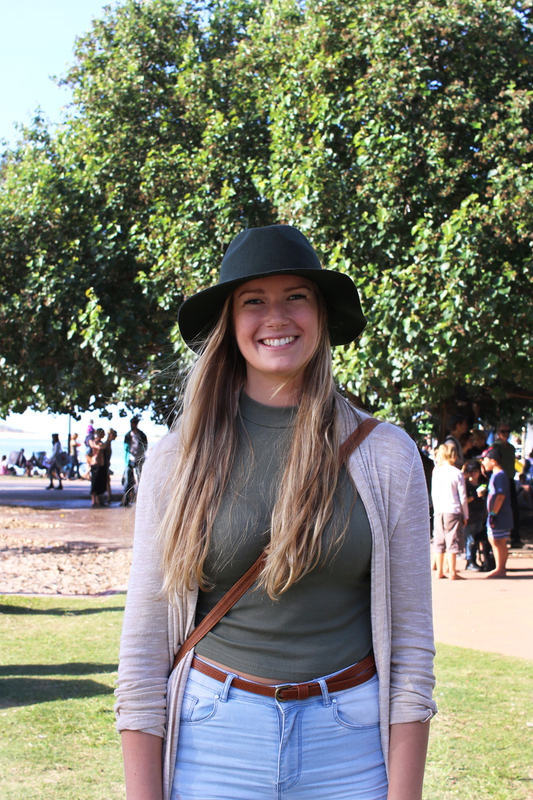 Amanda is a Fashion Teacher at the Sunshine Coast Tafe and has an impeccable eye for detail. She watched a tree full of children (mother duties) while we chatted all things sustainability, fashion, and World Environment Day Festival. Amanda had hosted a Sustainable Fashion show as part of the festival earlier in the day (which I was useless and I didn’t get to see), but she decided this wasn’t enough for her #garmentgratitude eco pledge. Her second action was bringing her eco coffee cup along to the festival and using it all day (a pretty good effort considering she was apparently running late). Amanda was grateful for her bangle. 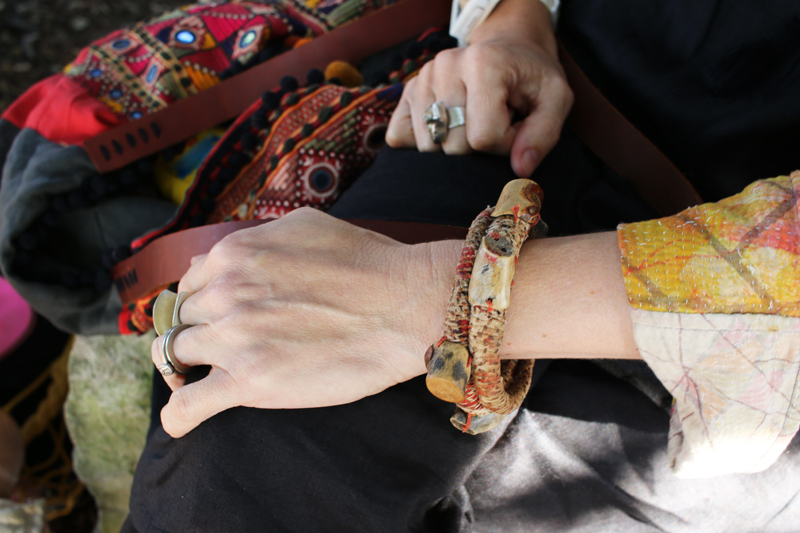 It was a gift from her husband in 2012 from the designer Amanda Caines who made the bracelet using traditional weaving techniques and items found in the River Thames. Already owning a necklace from the same designer Amanda loves her bracelet and was showing me how she has repaired bits that had come loose in the past. Amanda doesn’t have Instagram at the moment but her fashion students are trying to get her to create an account. Quelli was chatting to Jenna when I asked him if he would be happy to take part in the #garmentgratitude movement. We felt as though we had met before but couldn’t quite work out where. Regardless of the time and place of initial meeting we found a common passion for the documentary Unravel. He shared his love of the humanness this document fosters as it looks into the lives of women in India who are employed to shred and recycle garments from the west (if you haven’t seen this doco it’s worth a watch). He told me of his fetish for collecting shirts, and the time he wore a skirt and the simultaneous confusion and admiration he encountered while wearing it. On travels to Indonesia he picked up a full circle sarong among many other items. The other items slowly dissipated over time but the sarong remained due to it’s versatility. ‘It can be worn as a scarf, a skirt or a hood’ he explained. When asked what he was grateful for about his outfit Quelli’s stories only got better. ‘I’m grateful for my scarf that I picked up in Amsterdam’. 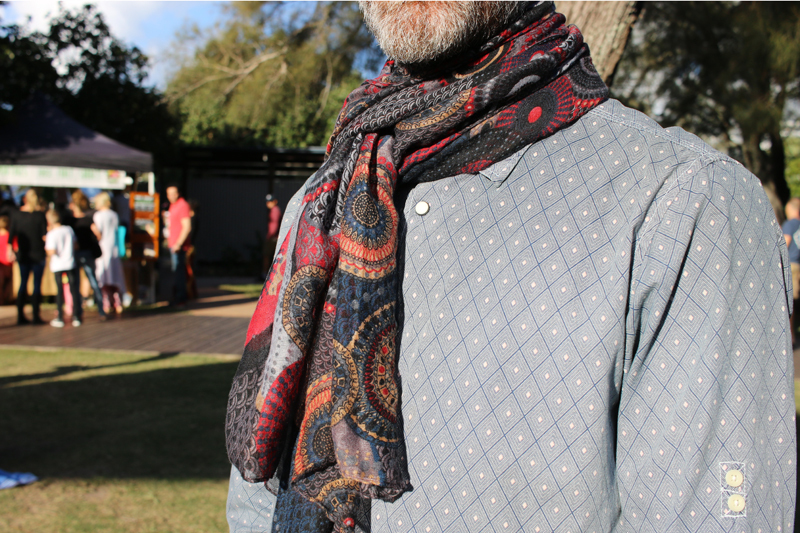 The scarf was from a great shop with a very enticing store front. When Quelli attempted to enter the shop he found that the storekeeper acted as a ‘bouncer’ for the merchandise. He would only let people in that passed his once-over gaze and were deemed interesting enough to enter. Quelli passed the test and was invited in. He spent a couple of hours browsing the store finding treasures (including the scarf) drinking vodka and tea, and smoking joints with the store owner who was more interested in meeting interesting people than running a big business. Quelli was prompted by his kids to clean out his closet recently. His eco action was to donate some of his tie collection to a friend who unpicks the ties and makes waistcoats from them by sewing them together. 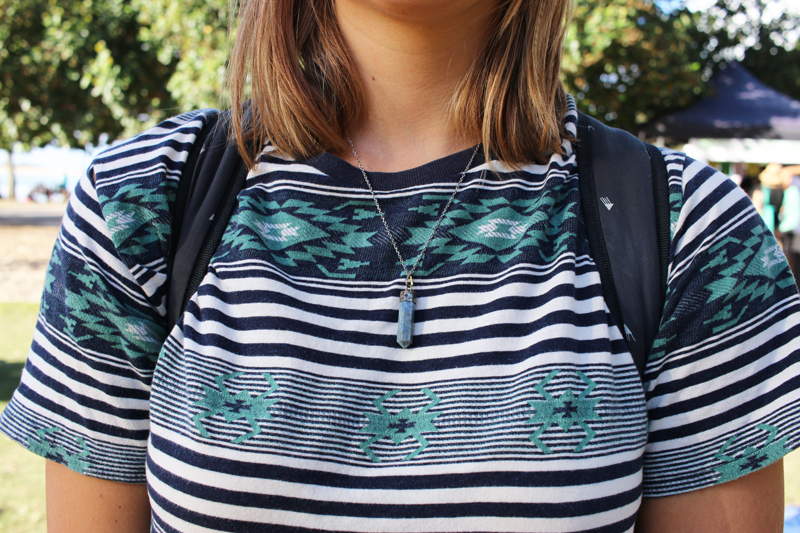 I was immediately drawn to the beautiful pendant that Sara was wearing. It just seemed to match her shirt and her spirit so well! 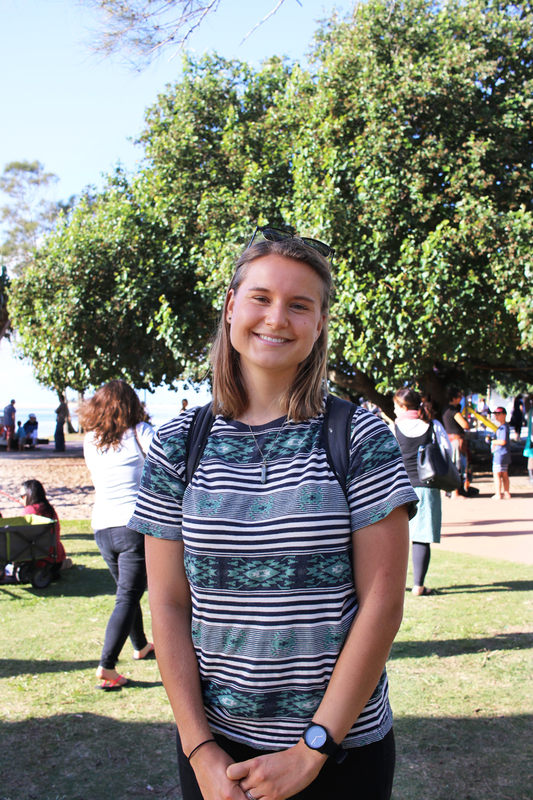 She was at the Environment Day Festival with her friends and had been photographing the festivities. She told me while I was taking her photograph that she was really grateful for her pendant (she played with it as she spoke) because it was something she had loved, broken, and repaired herself. she stated, and then proudly told me that she had glued it back together and it made her happy every time she wore it because she knew her fix-it job meant that it was still wearable. 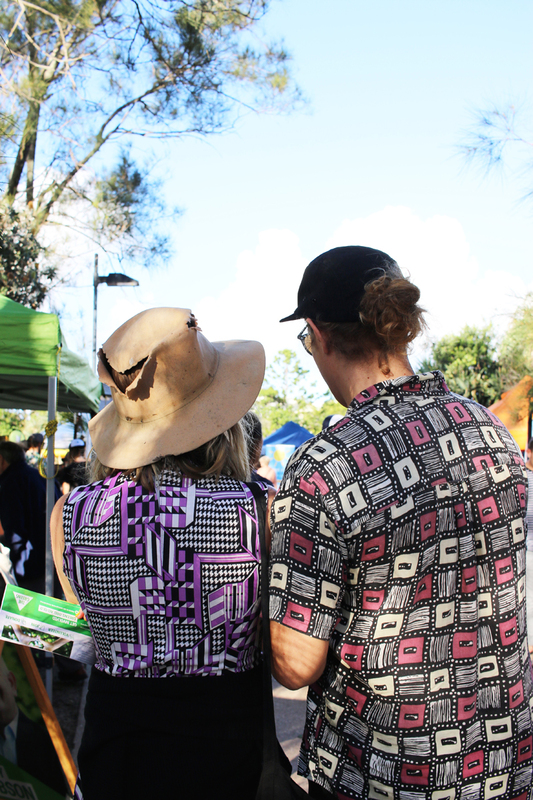 Her eco act for the day was attending the festival and being able to take photos of the stalls. She was planning to share the photos with the stall holders so they would have something to remember the day. ‘being able to wear a summer clothes in the beautiful winter weather’. Her treasured dress was something she valued so much that she had taken the time to hem it herself (something her friend was quite proud of and insisted that Amy told me about). Her positive eco action was ‘getting a native plant to encourage bees’ in her garden. because she must have known she was onto a style winner with it! She then went on to be thankful for her shirt and pants for the same sun-protecting reason. 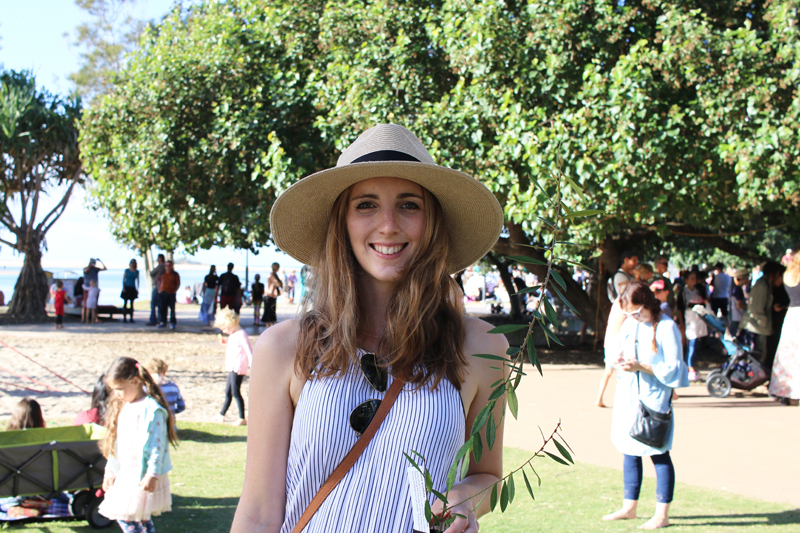 She had been enjoying the sunshine at the World Environment Day festival in sun-smart style and her eco-actions were signing petitions, specifically one that was aimed at preventing the build of high-rises on the Yaroomba coastline. She doesn’t have Instagram because she ‘doesn’t need another thing to take up her time’. Well put Celina! 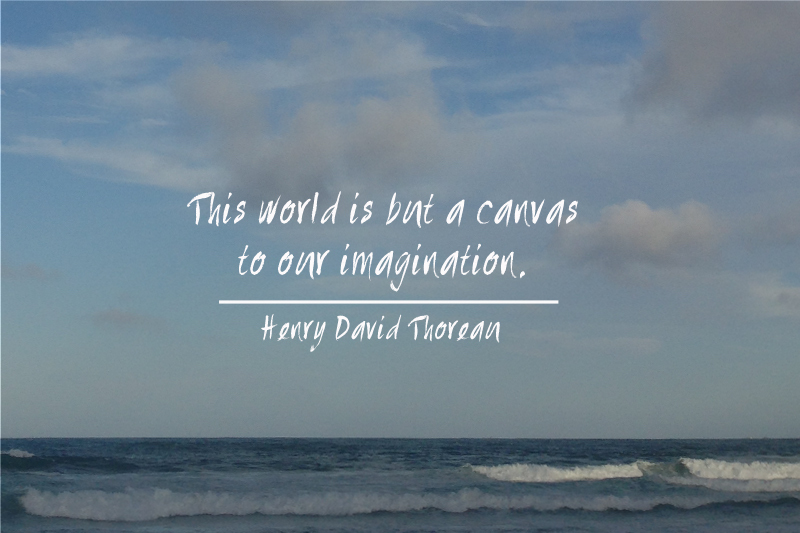 I hope that you have a wonderful World Environment Day and I would love to see your #garmentgratitude snaps. Start sharing them and I can add them to the wall and the Instagram account. A big thanks to all those who let me share their story!